Matt Koehler and I usually have a end of semester show-case of work done by the students in our classes. This semester Matt has been teaching CEP955 (Research design and methods for educational psychology and educational technology) and I have been involved with CEP917 (Knowledge | Media | Design). The end of semester showcase is coming up on the 10th of December (from 2:00 – 3:00 PM) in 133 D & E Erickson Hall. The students this year have done some really interesting work – which I will document here, hopefully sometime next week. We usually design a special poster for the event (below). 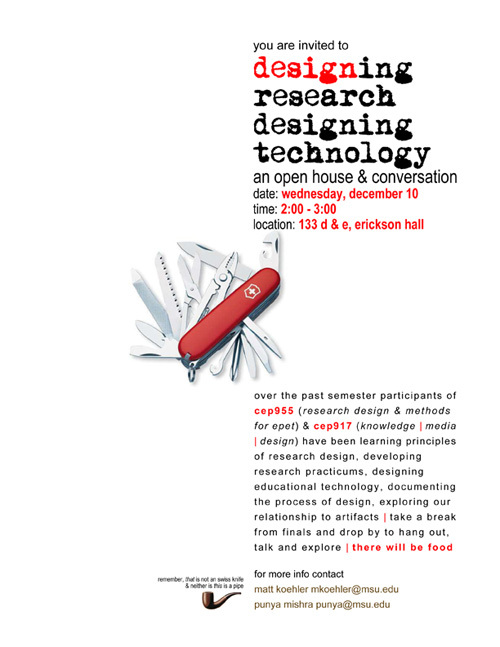 If you are in / or around Erickson Hall, we hope to see you there.